I saw Dale regularly over a 3 month period and he was a fantastic teacher. He is very calm and he explains things in the most simple way possible. Not only this but I found the LDC workbook extremely helpful in the respect that it helped me have an understanding of a topic prior to the lesson. I believe that this really increased my knowledge and skill at a very fast rate. Also the online theory test area is something that I found very effective. As a result of all this I managed to pass both my theory and practical tests first time!! I couldn't recommend Dale and LDC more! I would recommend them to anyone. I passed first time with Dale! 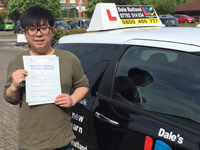 I am really glad to get Dale as a driving instructor, I have to admit I was quite nervous in the beginning but Dale was really easy to get along with and always kept his cool. Even when I made some pretty big mistakes he stayed calm and rather than me feeling like a terrible driver he just told me where I went wrong, how to deal with the situation properly and reassured me of the progress made in each lesson. Punctuality wise I could set my watch by Dale and I really like his car to learn in. 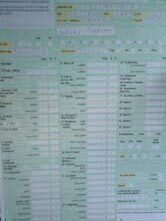 But amazingly after little over 4 months I passed my practical driving test with just 3 minors, which for me being a nervous driver to start, I know is pretty good. Thanks Dale couldn't recommend you enough. Congratulations to Megan Hatherley who passed her driving test 1st time today. A brilliant drive with only 5 minor faults, well done Megan!! Congratulations to Sam Fearnley Jones who passed his test 1st time after completing a one week pass course, Sam started his course on Sunday and sat his test on the Friday. It was a great drive too passing with only 2 minor faults, well done Sam!! Congratulations to Eve who passed her driving test 1st time with only 3 minor faults. A fantastic drive Eve, well done!! 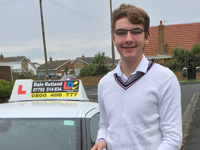 Congratulations to Aiden Thornborough on passing his driving test, a great achievement and well deserved. Well done Aiden. Another happy customer!! Congratulations to Shaun Penton on passing his driving test today. 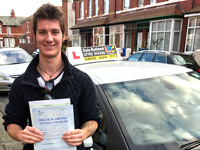 After not having any luck with another driving school, Shaun came to me and got the result he wanted. It was a great drive with hardly any minor faults. Well done Shaun!!! Congratulations to Michelle Grundy who passed her test 1st time after doing a one week pass course. Michelle posted the following review on my Facebook page: "Fab instructor would highly recommend to anyone, so patient and understanding. I passed first time after doing an intensive course, couldn't of asked for better support all the way through, thank you so much" Michelle also said she loved that she got to choose what to work on, and the LDC workbook and videos on the LDC YouTube channel really helped her prepare for her lessons. A great drive Michelle, well done!! Congratulations to Amber Hill who passed her driving test 1st time at Blackpool test centre, with only 4 minor driving faults. An excellent drive Amber, well done!! 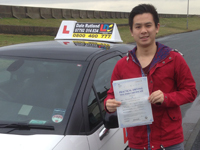 Congratulations to Dominic Li who passed his driving test 1st time with only 3 minor driving faults. A brilliant drive Dominic well done!! Congratulations to Bethany who passed her driving test today with hardly any driving faults, and during rush hour traffic!! A fantastic drive Bethany, well done! See you soon for your motorway lesson. Congratulations to Craig who passed 1st time with only 4 minor faults. A great drive Craig, well done!! Congratulations to Lucy who passed her driving test 1st time today, Lucy was feeling nervous before her test but managed to stay calm and had a great drive with only 4 driving faults. 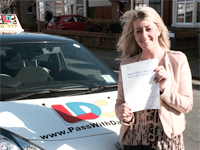 Lucy was so pleased with her result and couldn't wait to insure her car and get on the road. All the best Lucy, well done!! Well done to Zowie who passed his test 1st time. Zowie thanked me for helping him achieve his pass, and said he would be in touch to do the pass plus course. No more riding a push bike to work! Congratulations to Paul who passed 1st time with only four minor faults. Paul couldn't wait to start looking for his own car and thanked me for helping him get through his test. He also booked to do a pass plus course with me starting next week. Well done Paul and see you soon. Congratulations to Matthew who passed his test 1st time, with only one minor fault. A great drive Matthew, well done! 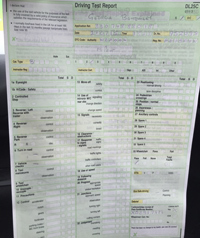 Congratulations to Georgia who passed 1st time on the 21st July, and came back with this clean sheet!!! Zero driving faults!!! Well done Georgia. Well done to Clare who passed on the 14th of July, Clare said "I would highly recommend Dale as an instructor as he is patient and friendly. The workbook and DVDs are a great help especially with the manoeuvres. Thank you for your patience and help." Cheers Claire see you soon for pass plus. Congratulations to Zoe who passed her test 1st time on the 6th July 2015. A fantastic drive with only 3 minor faults. No more taxis!! All the best Zoe. 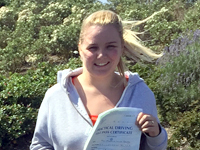 Congratulations to Gilly who after doing a semi intensive course, passed 1st time on the 26th June 2015 with only 3 faults. A great drive! Well done, and all the best. 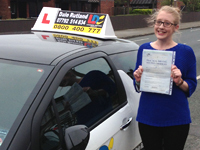 Well done to Kimberley who passed 1st time on 22nd April 2015, with just 3 driving faults. Kimberley said "I liked the workbook and watching the lessons on LDC's YouTube channel, they helped me prepare for each lesson. I liked the fact that I got to choose what I wanted to do on each lesson. I would recommend you to anyone, thank you." Cheers Kimberley, drive safe! 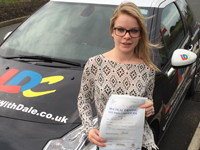 A huge well done to Chelsea, who passed her test on March 2nd 2015. Chelsea said "Thanks very much for putting up with me, I couldn't have asked for a better match to help me pass! You never gave up which was lovely." Thanks Chelsea, enjoy driving 'Fred'. 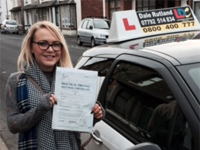 Congratulations to Emily for passing 1st time on the 2nd February 2015. She said "you gave me the confidence I needed, thank you so much for your help". Thanks Emily, drive safe and well done! 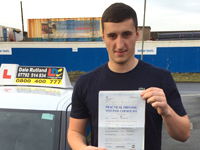 Congratulations Daniel who passed 2nd time round on the 1st December 2014. A great drive Daniel, well done!! Well done Ben who passed 1st time on the 28th January 2014 with only 5 minor faults. 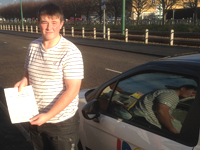 Congratulations to Daniel who passed 1st time on the 9th December 2013. 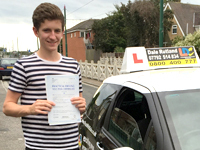 After passing his test Daniel went on to have a motorway lesson and drove really well. well done Daniel, and have fun later in the year when you drive round the Top Gear track!! 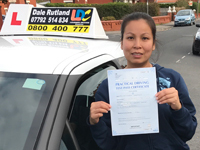 Sarah said: I tried lessons with other instructors and didn't get anywhere, but with Dale I felt comfortable and learnt very quickly, without him I wouldn't have passed my test and would recommend him to anyone thinking of taking lessons, thank you very very much. Cheers Sarah, well done and safe driving. Congratulations to Marcy who passed on the 31st October 2013, which was also her birthday. A great birthday present for you Marcy, well done. Well done to Kristan who passed 1st time on the 10 June 2013. I wish you all the best and safe driving. 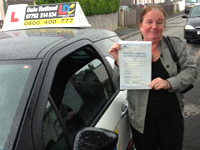 Belinda passed her test 1st time on the 28th May 2013. Belinda was over the moon when she passed, and thanked me for helping her. Well done! Congratulations to Lauren who passed 1st time on the 20 May 2013. 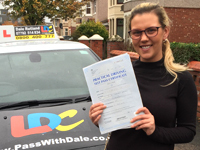 Lauren said:Dale was a great instructor who always remained calm, not only did he teach me the skills I needed to pass my test, but also to be a safe driver for life. The workbook and DVD prepared me for each lesson and helped me progress quickly. I'm so glad I learned to drive with a patient, friendly and fun instructor. Thanks Dale! Highly recommended!. Cheers Lauren, all the best, and hope you have many years of safe motoring. 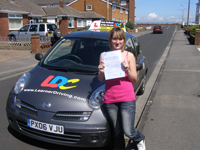 Congratulations to Natalie who passed her test 1st time on the 7th June 2011 at Blackpool test centre. Well done to Emma who passed her test on the 6th June 2011, with only 3 driving faults. 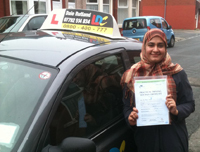 Congratulations to Maryam who passed her test at Blackpool test centre on 17th May 2011, with just 3 minor driving faults. Congratulations to Tom who passed on the 16th May 2011. Tom passed 2nd time round with just 3 minor faults. 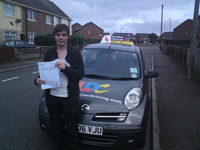 Well done to Sam who passed 2nd time on the 14th March 2011 with only 4 faults. A big well done to Sophie who passed her test 2nd time on the 7th March 2011 with only 4 driving faults. 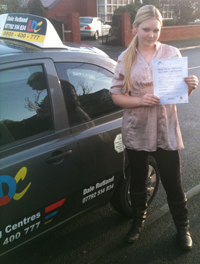 Congratulations to Samantha who passed 1st time on the 22nd February 2011 with just 6 minor faults. 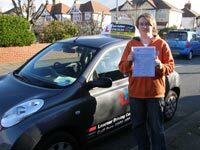 Well done to Mirelle who passed her test on the 8th February 2011 at Blackpool test centre, with only 5 driving faults. 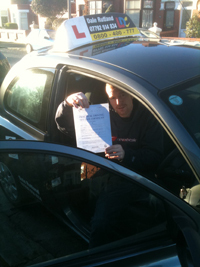 Well done to Peter who passed 1st time on the 8th February 2011. Congratulations to Nicola who passed 2nd time with only 2 minor faults on the 24th of January 2011. Nicola thanked me for my help, and my patience. Thanks Nicola, and i wish you all the best for the future. 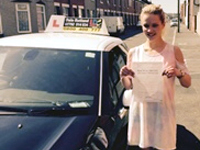 Congratulations to Maria Whitehead who passed her test at Blackpool test centre on the 18th of January 2011, Maria drove extremely well on her test and came back with only 4 minor faults. well done Maria. Well done to Ethan who passed his test on the 11th of January 2011 with just 5 driving faults. 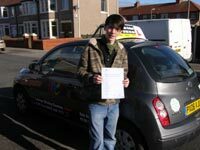 Congratulations to Kristian Palin who passed his test at Blackpool test centre on the 10th of January with only 4 minor faults. 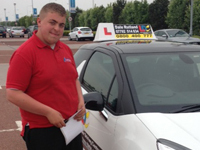 Kristian said he was feeling quite nervous before his test, but he kept a cool head and got a great result. He was over the moon when he passed and couldn't wait to get himself a car and get on the road. 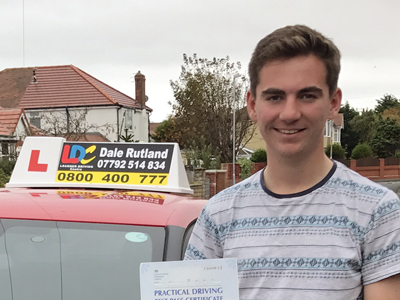 Kristian said "Dale was really good, and i would recommend him to anyone who wants a patient and friendly instructor" Thanks Kristian and good luck for the future. Congratulations to Alannah who passed her test 1st time on the 7th of October 2010 with only 3 faults. 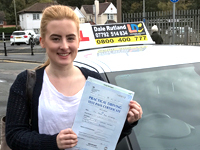 Alannah said "I would recommend Dale to anyone who was looking to start driving lessons, he was very patient and always remained calm. The LDC workbook also really helped me to get through my test quickly." Congratulations to Amie who passed her test on the 1st of October 2010 at Blackpool test centre with only 3 faults. A great drive Amie, well done..
Well done to Scott who passed 1st time on the 20th September 2010 with just the 3 driving faults. Scott said he would recommend me to anyone who wants to learn to drive. 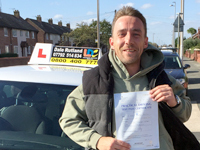 Congratulations to Ian who passed 2nd time on 31st August 2010, with only 4 faults. 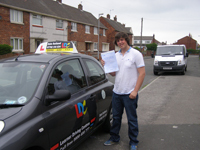 Well done to Robert who passed 1st time on the 31st August 2010, with just 3 minor faults. Robert really work hard in the weeks leading up to his test and it paid off, he was so happy that he passed 1st time and couldn't wait to get his own car. Congratulations to Samuel who completed a semi-intensive course spread over a couple of weeks, and passed 1st time on the 24th August with only 4 minor faults. 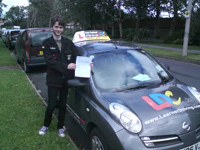 The LDC workbook and DVD helped a great deal in Samuel achieving a test pass. Well done Samuel. 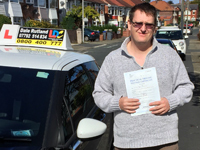 Congratulations to Paul who passed on the 16th August with just 4 minor faults, just in time to drive his newborn child home from the hospital. Well done Paul. 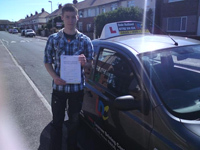 Well done to Tom who passed 1st time on the 10th August at Blackpool test centre. Congratulations to Carley who passed 1st time on the 9th August with only 5 minor faults. 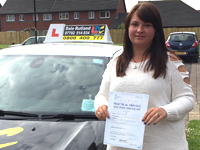 Congratulations to Lizzy who passed her driving test 1st time on 6th July 2010, with only 3 minor faults. A great result Lizzy, well done. Well done to Amy who after having her first test appointment annoyingly cancelled by the dsa, came back and passed 1st time on 29th June 2010, with just 3 minor faults. A great drive Amy, well done. Well done claire, you passed 1st time on 28th June 2010 with 3 minor faults, I know you doubted yourself, but i knew you could do it, Congratulations. 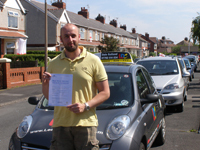 Congratulations to David who passed 2nd time round with only 4 minor faults on 22nd June 2010. David was understandably nervous on the day, but kept a cool head and got a great result. David said he would like to thank Dale for his patience, and would recommend him to anyone who was looking for a good instructor. 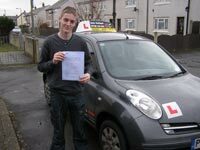 Congratulations to Alistair who passed 2nd time on 25th May 2010. Alistair also went on to complete the Pass Plus course, a great achievement alistair, well done. Congratulations to Lee Dodgson who passed 1st time with 6 minors on 20th April 2010. Congratulations to Gary who passed 2nd time with just 4 faults on the 8th march 2010. Gary got to test standard very quickly thanks to the LD system, Gary said the workbook and dvd helped me progress quickly, and I took my test after only 20 lessons. I would recommend Dale to anyone who wants to learn to drive. 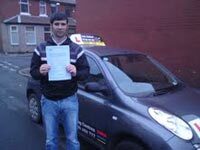 Well done to Kevin who passed 2nd time with only 3 driving faults on 15th February 2010. 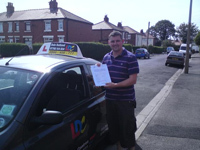 Congratulations to Mathew polke who passed his test 1st time on the 9th February 2010 at Blackpool test centre. 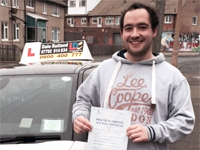 Mathew said he would recommend Dale to anyone wanting a friendly, patient instructor. 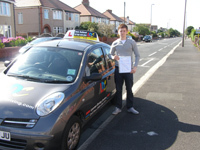 Well done to Chris Watson who passed 1st time with just 3 minor faults at Blackpool test centre on the 9th February 2010. 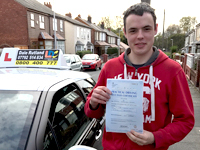 Congratulations to Sean who Passed 1st time with only 1 driving fault on the 26th January 2010. Sean said he would recommend Dale to anyone wanting to learn to drive. Well done to Amanda who passed 1st time on the 18 January 2010. Sophie passed her test on her 2nd attempt, but with only 3 minor faults, on the 14th December 2009. Well done Sophie. Well done to Natalie who passed her test 2nd time on the 7th December 2009, with just 3 minors. A huge well done to Tina who passed 1st time on 1st December 2009, with no minor faults whatsoever!!!! Yes a well deserved clean sheet.